I've been desperately waiting for this book since June when I read Defy. So when the clock hit 12, I was checking to see what site had it up so that I could download it and read it asap. Once I finally got my hands on Ignite, I just couldn't put it down! Holy Cannoli I was up all night reading this book until I ran out of pages to read. Ignite was action packed and full of mystery which I love! The characters where the same lovable characters from Defy except we got to know them a lot better and in different circumstances in this story. I love the angst and the struggle Alexa experiences through out the book; it leads her to very important realization towards the end of the story. Damian is perfect as ever. In his moments of vulnerability he displays his emotions whether it's pain or love with such honesty that at times its heart breaking. I love that Damian is able to display this vulnerability without seeming weak. I found myself melting time and time again over something Damian did or said. He's just perfect even with his flaws. The plot is fast paced and leaves you wanting more. The major issues of the novel are answered although there are so many unanswered questions that you want to continue reading to find out what happens next. I love the how the love story is written in this book. There is a hint of a love triangle but in reality there isn't a love triangle not a real one in any sense. I love that the romance is an element of the story and not the main focal point of the entire plot. 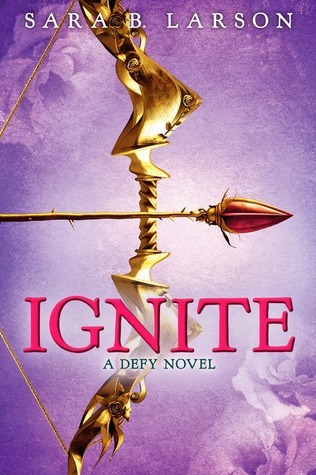 Ignite is a great second book to the Defy series. I can't wait to get my grubby little hands on the next installment of this series. Sara B. Larson out did herself with this book and I am excited that there is a third book coming!